Badass archer Yeoman was one of John J. Miller ’s characters. Group Affiliation: Former member of the US Army. Not only is Yeoman a phenomenal soldier, he’s also a phenomenal martial artist, bowman, tactician and outdoorsman. 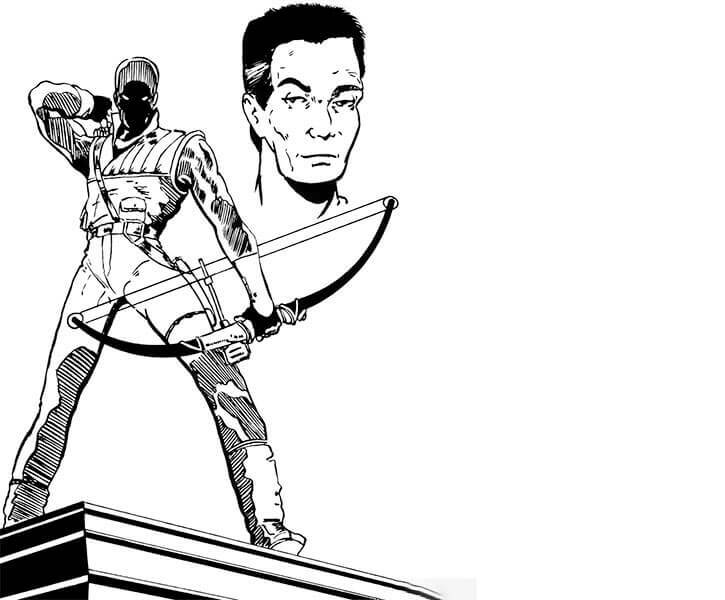 He is extremely proficient with Zen archery, and his speed when shooting a bow or a gun allows him to kill several armed men before they have a chance to react. Using those assets and his experience, he has proven to be a superior vigilante. Brennan is a hunter, comfortable in the night and shadow – as quiet as death, and as remorseless. His skills at stealth were even considered remarkable by Carnifex, who was an experienced covert operator with superhuman agility. His compound bow is armed with four-vaned razorsharp broadheads. 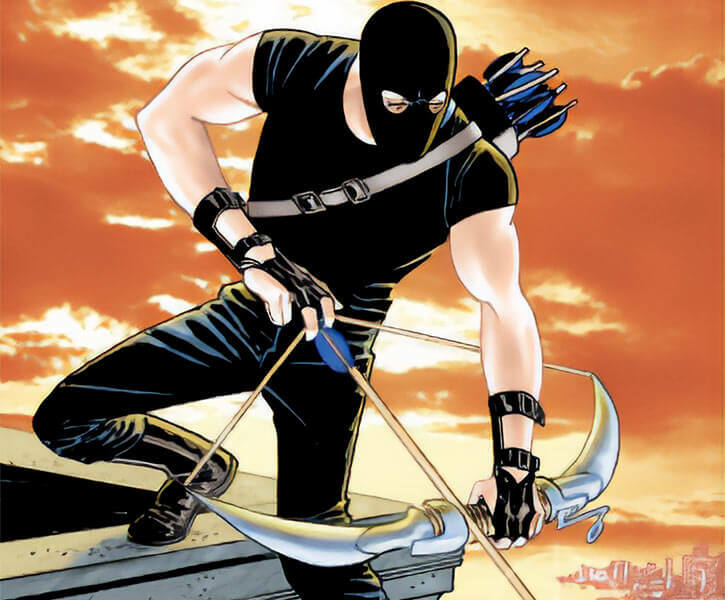 He sometimes uses explosives arrows (aluminum tubes packed with C4 with an impact detonator at the head). But these are aerodynamically unstable and not very reliable. Brennan carry his bow in knocked-down form in a briefcase, and can have it assembled and ready to shoot in a couple of seconds. Daniel Brennan enlisted in the Army in the late 1960s. He served in Việt Nam from 1968 to 1975. From enlisted man to sergeant to captain, he was a truly remarkable soldier. Brennan rose in rank to better protect and take charge of his men. He also supported the non-Communist Vietnamese people. In the early 1970s he was the head of a long-range recon company. During that time he married Marie Doc Do, a local. He also began to run afoul of the highly corrupt ARVN General Kien Phuc. Brennan tried to bring Kien Phuc down but he and his men were ambushed and the evidence destroyed. Brennan was almost court-martialed due to Phuc’s clout. During that time he also met Sergeant Squid, who would later become a man of the cloth. Kien Phuc then tried to have Brennan assassinated. But the assassins botched and killed his pregnant wife. Brennan attempted to return the favor, but that was during the Saigon debacle in 1975. Kien Phuc escaped to the US to became a respectable businessman. Brennan quit the Army in total disgust about how they handled the Kien Phuc case and the fall of Saigon. He wandered alone throughout Asia, selling his skills as a mercenary and living hand to mouth. In the early 1980s he ended up in a Zen monastery. Although he was not a good monk, he discovered an startling affinity with Zen archery. He quickly reached shado. Brennan made it back to the US in 1983. An ex-Tiger Scout comrade named Minh sheltered him in his restaurant for a while as he re-acclimated. He finally left for the Catskills , living as a hermit and earning money selling handmade bows and arrows. After three years, he was contacted by Minh. The restauranteur knew Brennan wanted to avenge himself on Kien Phuc – and that the former general now was in New York. However, Minh was killed shortly after Brennan’s return to New York City. Kien Phuc’s men, the Shadow Fist Society, abducted his daughter Mai to exploit her Ace healing ability. Brennan rescued Mai and started acting as a super-hero to hunt down Phuc. During this time he began a long affair with underworld information broker Chrysalis. Yeoman also fought alongside Ace pimp Fortunato and the alien Dr. Tachyon during the Swarm invasion. Chrysalis’s emotional distance eventually drove Brennan away from her. Soon afterwards, he started dating the thief Wraith (Jennifer Malloy). Still pursuing Kien Phuc, Brennan had his face modified to add epicanthic folds to his eyes. This made it easier to go undercover in the Shadow Fist Society as a soldier of fortune named Cowboy. He rose quickly within the organisation, proving himself a top enforcer in the war against the Mafia. However he had to blow his cover to save Dr. Tachyon when the Fists took over his clinic. Soon afterwards, Brennan had a face to face encounter with Kien Phuc. The crime lord told him Wraith would die if Brennan didn’t give up his vendetta. Yeoman chose love over revenge. Leaving New York City, Brennan and Malloy settled in a small town in the Catskill Mountains. Brennan worked under an assumed identity as a landscaper. In July of 1988 an unidentified Ace killed Chrysalis. Brennan and Wraith returned to New York to seek her killer. As Yeoman attempted to unravel the mystery of Chrysalis’s murder he discovered Chrysalis’s associate Mother. Mother was a Joker who had birthed a group of miniature fairies, gnomes, and other diminutive versions of mythical creatures. Mother was killed in a fire soon thereafter and Brennan effectively adopted her children. Yeoman finally determined that Hiram Worchester had killed Chrysalis. He confronted Hiram in Atlanta, where he was assisting Gregg Hartmann’s presidential campaign. Hiram explained that it was an accident. He had panicked when Chrysalis threatened to reveal the existence of Ti Malice, a creature that had enslaved Hiram and numerous others. Brennan relented in his pursuit of vengeance when Hiram decided to turn himself over to the law. That was as much to help the innocent man framed for Chrysalis’s murder as anything else. Yeoman and Wraith returned to their peaceful mountain retreat in the Catskills, taking Mother’s children with them. Brennan’s peace was disrupted one last time. His archenemy Phuc allied his Shadow Fist organisation with a dangerous group of body-switching Aces known as the Jumpers. Phuc decided to celebrate this powerful alliance by tying up a loose end. He sent his men to assassinate Brennan and Malloy just as he had planned with Brennan and his first wife long ago in Việt Nam. Brennan foiled the attack with the help of Mother’s children. However Jennifer was seriously injured. She fell into a coma and began to literally fade away as she lost control of her phasing powers. Brennan rushed her to Tachyon’s clinic. He was telepathically linked to Jennifer by a telepathic healer in order to revive her. Phuc tracked him down, only to be thrown into the mind link himself. Phuc had hoped to switch bodies with Brennan before killing him, to get the most grievous possible revenge. Brennan managed to revive Jennifer. He left Phuc caught in a mental feedback loop of Phuc’s hated childhood, comatose and trapped in a personal hell forever. The healer examined Phuc and found his mind too damaged to ever recover. 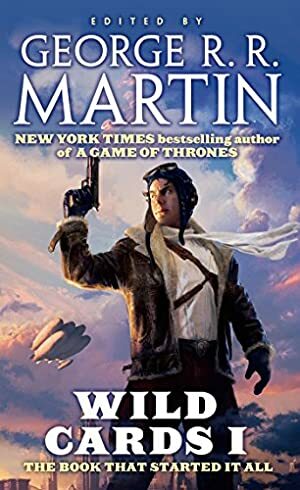 With Jennifer healed and his vow of vengeance satisfied, Brennan went back to enjoy his quiet retirement in the mountains with the woman he loved. This idyll was briefly interrupted in 2003 when he helped Carnifex and Jay Ackroyd during a misadventure in the same area of the Catskills where Brennan lived. But he got back to his normal life as soon as the situation was resolved. With his tanned skin and dark eyes, he can pass for Asian to most people. 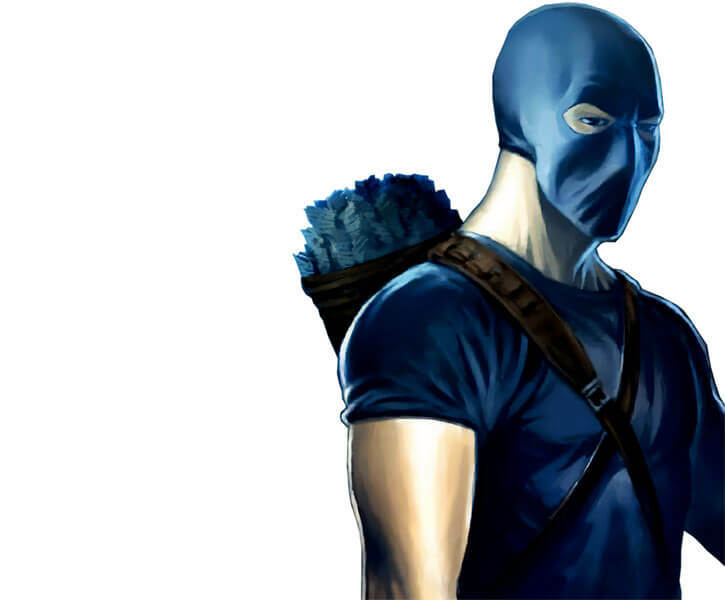 The cosmetic surgery he underwent while working with the Shadow Fist Society enhanced that aspect of his appearance. But he eventually had those procedures undone, as his undercover work was done. Brennan cares about people and just causes. He tried to ignore that part of himself when he became a hermit, but couldn’t. He can’t ignore his duties, either. He feels deep personal responsibility about what he perceives as his failures, such as Kien Phuc remaining at large. He has a harsh idea of justice, and will not hesitate to kill when he feels it is necessary. However, he gets no pleasure from killing. As he keeps killing, he will accumulate guilt. He has stopped being a vigilante due to this growing distaste for death and his love for Wraith, but under the right circumstances he could become a vigilante again. Brennan does not consider himself a hero, simply a man doing a job no one else will or can do. His loyalty is unshakable. He chose the Ace of Spades as his calling card because it was a Vietnamese symbol of death and ill fortune. Likewise, the nom de guerre “Yeoman” was because Operation Yeoman was the mission he had been on when Kien betrayed him. Both were deliberately chosen to unnerve his nemesis Kien. 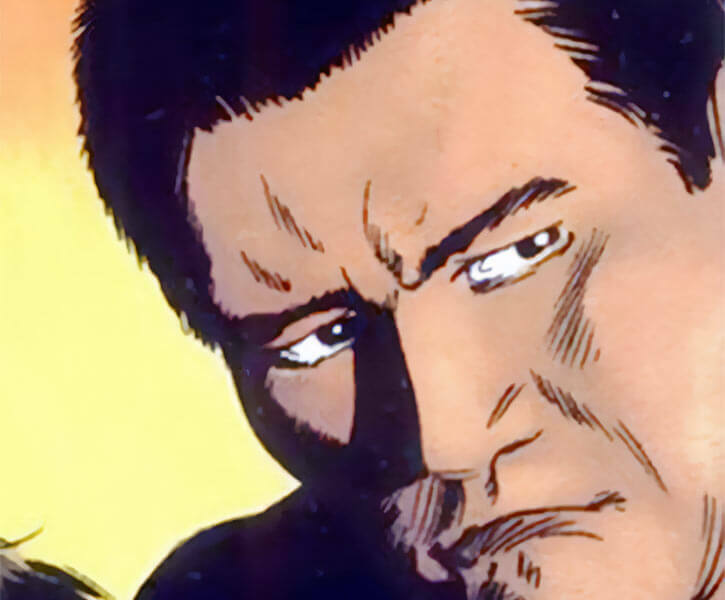 Since the Yeoman identity was built specifically with his arch-nemesis in mind, if Brennan were to acquire a new foe he’d likely create a new identity. He’s exactly the kind of man who would appear in the Grell Green Arrow series. 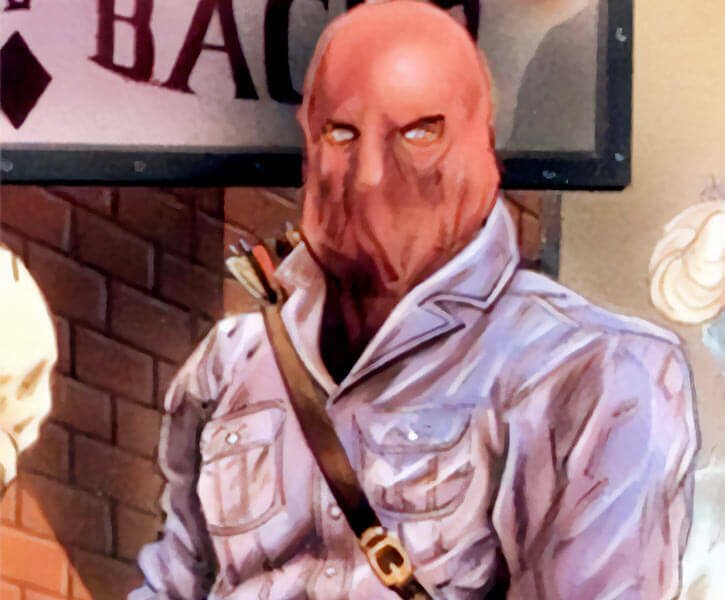 Brennan has ample common ground with Green Arrow, Shado, Roy Harper or Eddie Fyers. His skills and willingness to kill would make him a great ally/foe for the Batman. He could easily have fought with the second Vigilante. 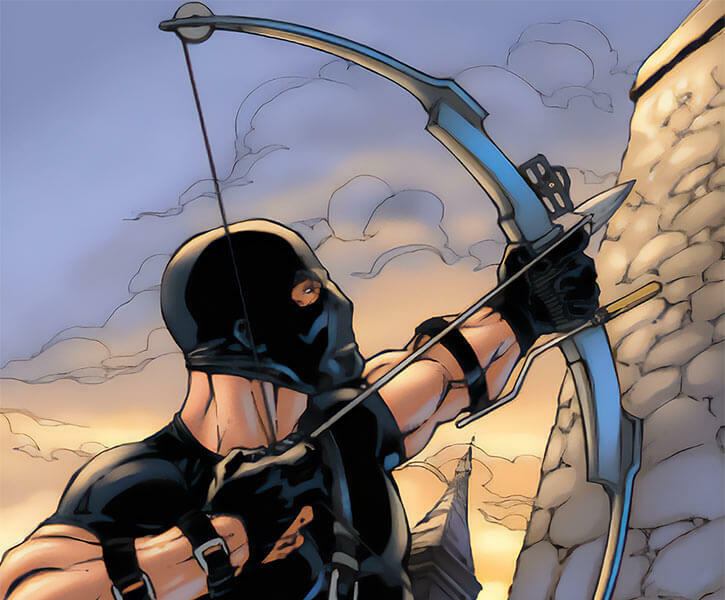 In the DCU, he was probably trained in Zen and archery by the same people who trained the Vigilante. His relationship with Wraith might become a relationship with Onyx. Iron Nerves, Languages (Cantonese, French, Japanese, Spanish, Vietnamese), Lightning Reflexes, Scholar (Outdoorsman, Zen), Schticks (Speed Shooting, Fast Draw, Lightning Release). Fortunato (Low), Wraith (High), Street (Low), Chrysalis (Low), Father Squid of Our Lady of Perpetual Misery Church of Jesus Christ Joker, (High), Dr. Tachyon (High). MIA to Wraith, Dark Secret (US Army deserter), MIA to leaving an ace of spades as a calling card. Bow [BODY 05, Projectile Weapon: 04, Ammo: 01, Rec. STR: 04, R#02, Bow Advantage (actual EV is 05, actual Range is 06), Limitation : Low Penetration]. Quiver [BODY 02, Projectile Weapon: 04, Ammo: 30, Limitation : Ammunition load for the bow]. Explosive arrows (x4) [BODY 01, EV 06 (Area of Effect 0 APs), R#05, Limitation : Must be fired from a bow, Grenade drawback, Range only has half the normal final APs for that bow]. If Yeoman carries a gun (which is likely if he’s passing himself off as a criminal to infiltrate some mob), he’ll prefer a Browning Hi-Power [BODY 04, Projectile Weapons: 04, Ammo: 13, R#02]. Brennan usually carries his bow broken down and stored inside a flat leather case. 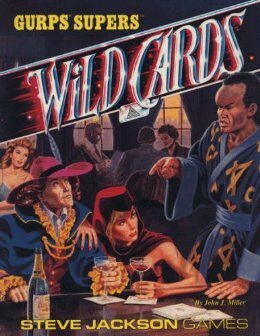 By Sébastien Andrivet, based on GURPS Wild Cards. 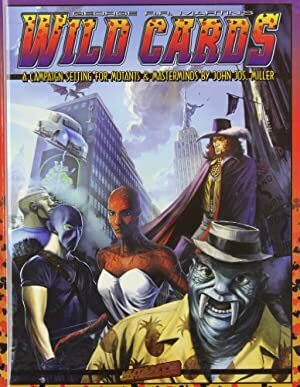 Source of Character: Wild Cards books. Helper(s): Roy Cowan kindly provided the second half of Brennan’s History, as well as various comments and some quotes. Pufnstuf also helped a fair bit.